After graduating from London’s Central Saint Martin’s (BA Women’s Wear Design), and working for designers such as Vivienne Westwood and Temperley, Jeanine Hsu created niin in 2005, with the aim of designing jewellery using natural materials where the basics of nature become a luxury. Her achievements have been recognised with academic appointments at the Hong Kong School of Creativity, where Jeanine was Artist in Residence in 2009; and The Hong Kong Design Institute where she is a part time lecturer and undergraduate tutor in Jewellery Design. Since launching at London’s Portobello and Spitalfields markets, niin is now available at select locations worldwide including Mandarin Oriental Hotels, Four Seasons Hotels, Aman Resorts, Ku De Ta in Bali and is being promoted to leading department stores. It has featured in numerous magazines, including Tatler and Elle; and accessorised various fashion shows and displays, including the Eco-chic/Redress Asia show alongside John Hardy creations and London’s Harrods displays. Autumn is upon us but we still see a lot of green in the Fashion World this Season. Celebrities and designers are environmentally conscious this Season with the Green Carpet Challenge, Bottega Veneta is "turning vegan", and we at niin are celebrating our third anniversary with an eco-encouraging fashion event. The Green Carpet Challenge is Livia Firth's environmental project in line with the Fashion4Development initiative with the United Nations. Well-known and respected designers are taking part through their eco-friendly creations, advocated by prestigious celebrities. 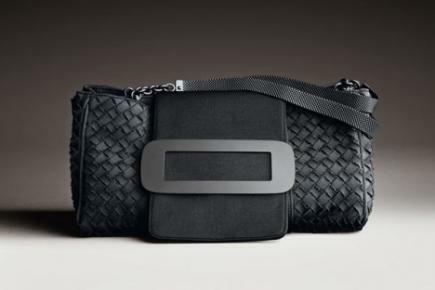 Bottega Veneta is known for its artistic prowess in creating Italian luxury leather goods, but is now creating sustainable "vegan-friendly" handbags for the Cruise 2013 collection. The new “Carta Giapponese” purses embody the brand's woven style. However, instead of using leather bands, creative director Tomas Maier captures inspiration from the ancient Japanese art of paper-making. The bags are constructed using Japanese washi paper, made from the bark of the quick-growing kozo tree and environmentally sensitive dyes.